Lisbon is divided into frequesias or civil parishes. Belém is one of these freguesias. Only about 10 minutes outside of the Lisbon city center, Belém contains a great amount of important historical sites within very close walking distance of one another. One of these is the Torre de Belém. 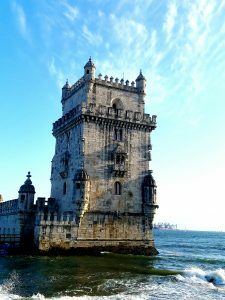 Translated as Bethlehem Tower, it was once an important part of the defense of the port of Belém against enemy invaders. 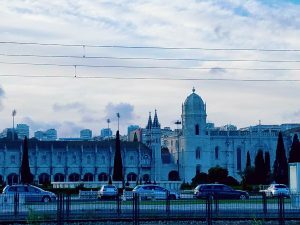 Across the road from the Torre de Belém is O Mosteiro do Jerónimos (St. Jerome’s Monastery). The monastery/church is a Unesco World Heritage site. It was built by King Manuel I of Portugal in the early 16th century with money from all of Portugal’s colonies in the New World. 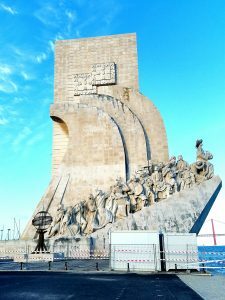 A short walk from the Torre de Belém is the Padrão dos Descobrimentos (Discovery Monument). This was built to celebrate the history of the Portuguese as explorers. 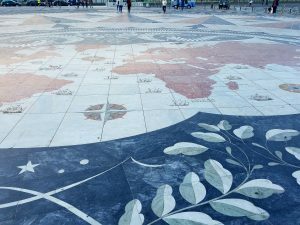 On the same site as the Discovery Monument is a beautiful tiled world map in the center of the plaza. 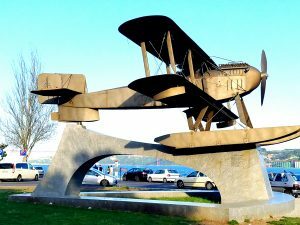 Finally, there is the Gago Coutinho Biplane Seaplane monument. This monument celebrates the first trans south atlantic crossing in 1922 by the Portuguese aviators Gago Coutinho and Cabral. They started in Lisbon, Portugal and finished in Rio de Janeiro, Brazil. Although this was 3 years after the first non-stop transatlantic crossing (Newfoundland, Canada to Dublin, Ireland) by 2 British aviators, it was still important as having pioneered the use of artificial horizon. Belém is full of Lisbon’s historical sites, all of which are extremely close to each other and is only a short hop from Lisbon’s city center. For this reason it can easily be done in a half day. Next Next post: De Falamos a Hablamos ….a Barcelona Vamos!! !